Well Today, we saw there are lot of changes happened around us in the network space. We have so many players are coming to work on the next generation networks. Today we can say the network application goes towards the cloud and the hardware of the network goes towards the virtualization. So now question rise, where and why we are using the NFV ? What does NFV means ? Starting from the NFV, Network function virtualization is the change in the architecture of the network domain where all the hardware is replaced by the one server where all the virtualized devices are being installed and act as router, switch, firewall, load balancers and many more. So you mean NFV is the concept of removing the hardware at the customer location mainly Router, Switches, Firewall, load balancers with one Server which has all these virtualized functions in it. Now What this NFV consists of ? NFV is a building block in the network and may connect chain together and create communications with in a box. On the base of x86 servers we have the hypervisor on the top of it. We have various virtual machines on the top of hypervisor on which we have install different OS (Operating Systems ) of the various applications you want to perform in the network like you can have the OS for Router, OS for Switch, OS for Media Server, OS for Web Server, OS for Load balancers and so on. All these are on the x86 server. 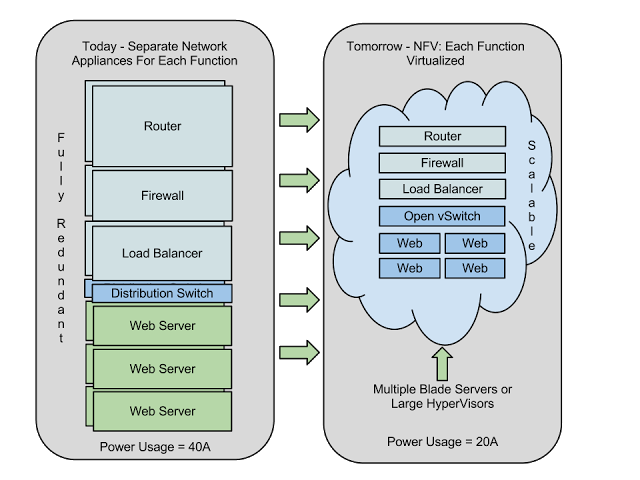 The technology is called as NFV. So if we are talking about the VNFs, the VNFs or Virtualized network functions are software implementations of network functions that can be deployed on a network function virtualization infrastructure (NFVI) like in the x86 servers. Network function virtualization infrastructure (NFVI) is the thesaurus of all hardware and software components that build the environment where VNFs are deployed. The NFV infrastructure can spread over the several locations. The network providing connectivity between these locations is considered as part of the NFV infrastructure. Making the work around the NFV or Network functions virtualization management and orchestration architectural framework (NFV-MANO Architectural Framework) is the collection of all functional blocks, data repositories used by these blocks, and reference points and interfaces through which these functional blocks exchange information for the purpose of managing and orchestrating NFVI and VNFs. So you are replacing all the hardwares at the enterprise network with a single server where all the functions are being including in a single box. So you can save your money and the hardware cost in your network and even simplify the network as per the administration. With the use of the NFV, we will come up with the next generation networks SDN and how it works in the network, we can also soon come up with the automation part of the next generation networks which is widely accepted now a days. There are lot of solutions provided by different vendors in the market. Cisco is coming with the ACI features with the use of the Cisco nexus 9K devices in the infrastructure. Similarly Juniper comes up with the solution of Juniper contrail. Cisco closely working on the SDN and the automation part as well to deploy the next generation networks in the enterprise networks.